Whether it be christmas trees, greenhouses, or exotic animals, we have a voracious appetite for large-scale LEGO constructions. 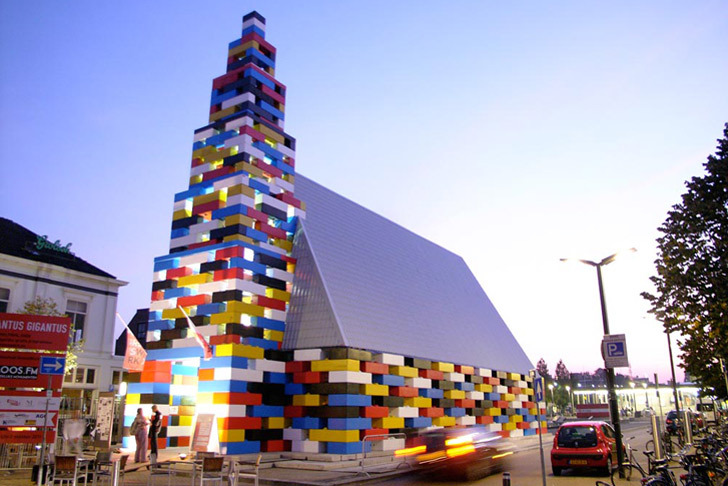 Dutch design firm LOOS.FM expanded on the life-size LEGO trend with Abondantus Giganticus, a 20 meter tall church-shaped temporary pavilion created for last year's Grenswerk Festival in Enschede, The Netherlands. The structure was constructed from Legioblocks, which are completely reusable, stackable concrete construction blocks the size of pyramid stones which are typically put to use in industrial applications. As their name suggests, Legioblocks lock together in much the same way as their plastic counterpart, proving to be a versatile, efficent construction solution. 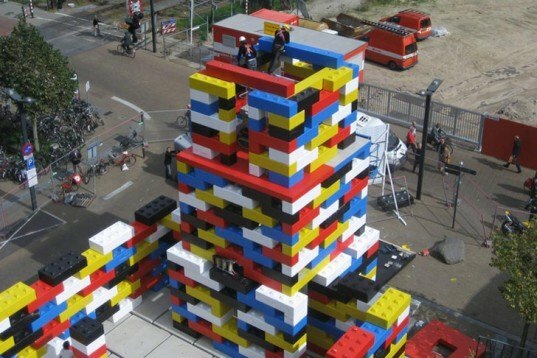 In Abondantus Giganticus, LOOS.FM painted the blocks to reference the construction toy after which Legioblocks are named. As for Abondantus Giganticus‘ church-inspired design, LOOS.FM wanted to create a space where festival goers could congregate – a structure that would be instantly recognizable from its form as a public arena. The blocks were assembled in a honeycomb formation, stacked so as to leave regular open spaces throughout the walls of the building. These gaps allow for an open, airy integration between the events which occur inside the church and the ever-changing outside environment. The designers note the proportional peculiarity of the building; while LEGO bricks call up feelings of remembrance, sentiment and creativity, the scale of the church inspires the spectator with awe. The pavilion contained multiple separate spaces for festival goers which included indoor and outdoor stages and a room in the spire of the airy church-shaped building. Events which took place at Abondantus Gigantus included concerts, an opera, a sports day and of course both a church service and a LEGO building contest. When the week-long festivalended in October 2011, the pavilion was easily disassembled, with the blocks intact and able to be reused. LOOS.FM wanted to create a space where festival goers could congregate - a structure that would be instantly recognizable from its form as a public arena. The blocks were assembled in a honeycomb formation, stacked so as to leave regular open spaces throughout the walls of the building. These gaps allow for an open, airy integration between the events which occur inside the church and the ever changing outside environment. The designers note the proportional peculiarity of the building; while LEGO bricks call up feelings of remembrance, sentiment and creativity, the scale of the church inspires the spectator with awe. The spire of the pavilion stood 20 meters high. Abondantus Giganticus served as the pavilion for the 2011 Grenswerk Festival in Enschede, The Netherlands. Events which took place at Abondantus Gigantus included concerts, an opera, a sports day and of course both a church service and a LEGO building contest. Architectural drawings for the pavilion show the open plan simplicity of the church-inspired design.